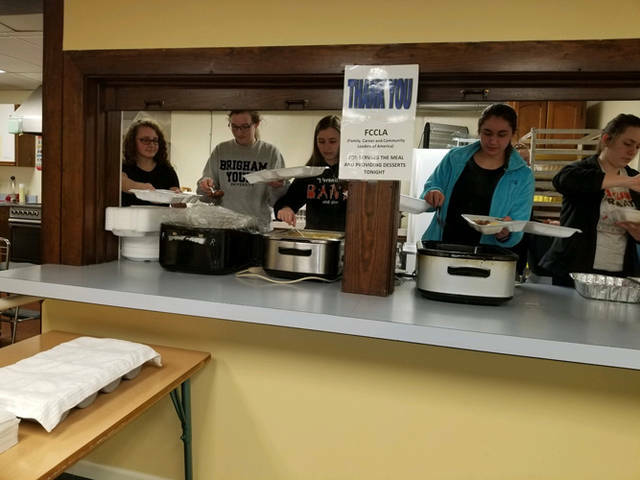 Versailles FCCLA members Alyssa Dieringer, Morgan Barlage, Madelyn Vogel, Chloe Vogel, Larissa Jones, Jenna Mangen and Savannah Toner helped work at Community Meals on April 10. VERSAILLES – The Versailles FCCLA Chapter helped work at Community Meals on April 10. Community Meals is held in the basement of Trinity Lutheran Church. The Versailles family consumer science classes provided the desserts for the meal. The members who participated included Alyssa Dieringer, Morgan Barlage, Madelyn Vogel, Chloe Vogel, Larissa Jones, Jenna Mangen and Savannah Toner.